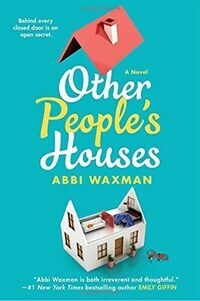 "Abbi Waxman is both irreverent and thoughtful." --#1 New York Times bestselling author Emily Giffin Named A Highly Anticipated Book for 2018 by InStyle online, Elite Daily, and Hello Giggles! One of Popsugar's "10 Books Your Favorite Celebrities Are Reading This Spring" The author of The Garden of Small Beginnings returns with a hilarious and poignant new novel about four families, their neighborhood carpool, and the affair that changes everything. At any given moment in other people's houses, you can find...repressed hopes and dreams...moments of unexpected joy...someone making love on the floor to a man who is most definitely not her husband... record scratch As the longtime local carpool mom, Frances Bloom is sometimes an unwilling witness to her neighbors' private lives. She knows her cousin is hiding her desire for another baby from her spouse, Bill Horton's wife is mysteriously missing, and now this... After the shock of seeing Anne Porter in all her extramarital glory, Frances vows to stay in her own lane. But that's a notion easier said than done when Anne's husband throws her out a couple of days later. The repercussions of the affair reverberate through the four carpool families--and Frances finds herself navigating a moral minefield that could make or break a marriage.